What do you think about when the term “medical marijuana” comes up? Cancer patients? Fibromyalgia? Pets? The latter is probably not going to be one of the first things that hits your mind, but more and more people are turning to legalized marijuana in various forms to help heal and calm their cats and dogs. Does it work? Perhaps – but the idea is novel and it can help boost your business. Animal lovers who have turned to cannabis-based products to alleviate a host of pet maladies, including seizures, inflammation, anxiety and pain, are reporting similar results. 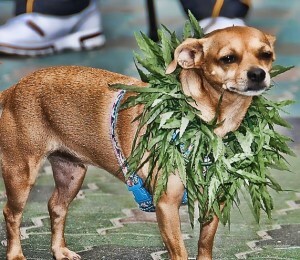 Although they have not been approved by regulators, marijuana-based treatments are being used not only for cats and dogs, but for pigs, horses and domesticated wild animals. From treats and chewable sticks made from hemp to CBD oil that can be given internally, there are many options for pet moms and dads to give to their fur baby. The Food and Drug Administration has not approved cannabis for pets, in part because there is little research showing its effectiveness. Veterinarians are not allowed to write prescriptions for the products and, in states where marijuana is illegal, are wary of discussing the idea. Last year, a proposed state law was defeated in Nevada that would have made it possible for veterinarians to prescribe cannabis to pets with chronic illnesses. Still, users swear by the products. And that’s what counts, after all. So, what does this mean for the average marijuana merchant? Well, this gives you a brand new customer base. Every if pet parents are not wanting to light up or vape themselves, offering a natural alternative to help ease their pet’s pain or mood issues can bring you a new bunch of customers. However, you need to make sure that whomever you are getting your goods from is legit – because there have been so many recalls on poorly made and contaminated pet treats. Do your research as a marijuana merchant, and with good product and good marketing your customer base will boom in no time at all. This entry was posted in Marijuana Business Funding, Marijuana Industry, Marijuana Merchant Account and tagged Marijuana Business, Medical Marijuana, Medical Marijuana Funding, Pets on Pot by admin. Bookmark the permalink.